Crestron is one of the most recognizable names in AV, and with approximately $1.5 billion in market share, it is unquestionably a top industry influencer. But its investment in education keeps even the highest-level executives connected to customers. This community-driven culture was on display last week during the 18th-annual Crestron Masters, a three-day training and professional development conference. Nearly 1,000 Crestron programmers and designers participated in 129 sessions during event. 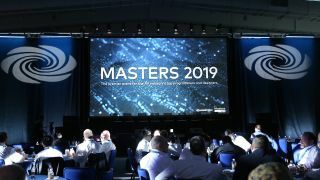 There were courses devoted to everything from voice control integration to network security, but what united Masters was an emphasis on change and how to stay proactive as business and technologies evolve. It’s time to adapt, and this was embodied in Crestron’s modular Flex line. Crestron is also encouraging its network to focus on the user experience (UX) to spur the next chapter of growth. Here are other key takeaways from Masters 2019. “We have to approach projects differently,” said Rich Sasson, global director of technical services, Crestron. “Listen to the customer. What are their challenges? What are their pain points? Present solutions, but the customer and their needs should drive the conversation.” Sasson said it’s essential to define the scope of work but “stop selling the box.” Experiences and applications should come first, technical ingredients should come second. Crestron’s expansive catalog supports “95 percent of AV projects,” Sasson said, from highly custom projects to repeatable spaces like huddle rooms. It’s reaching the entire enterprise—not just the top 15 or 20 percent of custom projects—that holds significant business potential for AV pros. For meeting spaces, the Crestron team suggests striking the balance between features, functionality, and seamless UX. Enter the Crestron Flex line. Flex solutions are available in myriad forms, but they all bring the same user experience—from C-level conference spaces to huddles. The Crestron Flex P-Series includes a Voice-over-IP desk phone. The Crestron Flex M-Series offers a tabletop conferencing system. The Crestron Flex B-Series adds the wall-mount smart soundbar. The Crestron Flex C-Series is an integrated UC kit. With the Flex line and its native integration for soft codecs, workflow can lead. “You now have a full UC engine that will run Microsoft Teams or whatever solution the company uses.” Flex lets users tie in space analytics, networked audio, video distribution, and room scheduling. “There are big opportunities out there,” Sasson added. He cited the AVIXA IOTA report, which forecasts the global AV market to reach $230 billion by 2023. “Proven by the popularity of Mercury, we have to embrace change to grow.” Flex builds on Mercury’s success and takes it further. Nearly 1,000 Crestron programmers and designers participated in 129 sessions during event. Crestron is encouraging its dealer base to adopt the tools and the business models to support new revenue streams. Managed services via XiO Cloud and Fusion Cloud, for example, can let integrators remotely manage AV for clients. A firm with the right team in place can utilize those systems to provide NOC (network operations center) services. 5. New Lease on AV? Leasing is another model AV integrators and tech managers are considering. “It’s an interesting shift,” Vaughan said. “I believe the leasing model is something we should look into. With leasing and service-level agreements, the cost of the programming becomes amortized. It no longer becomes a capital expense but instead it is an operational expense.” He argues that with a refresh cycle of three to five years, moving from CapEx to OpEx makes sense. It’s similar to the smartphone model wholly embraced by consumers. Nic Milani, executive director, commercial product marketing, Crestron, said that to fuel business growth, AV integrators would benefit from understanding the needs of other industries. “We can connect the dots and expand outward,” he said. “We have to go help solve the problems” of AV-adjacent industries, like architects and designers. The benefits of AV over IP are clear. When installers move from isolated, fixed networks to the AV-over-IP model you “no longer have to worry about fixed ins and outs. And there are trillions of miles of Cat-5 cable in the walls,” Milani said. Crestron’s DM NVX operates on the existing network, which translates into cost savings of “not ripping out the cables,” he added. AV over IP is at an inflection point, and it’s powering new industries. For example, gaming is experiencing explosive growth. Milani explained how St. John’s University is using DM NVX to power its eSports operation, sending video, audio, and control over an existing network. NVX is also certified to work in the highest levels of secure spaces.